A unique way First Congregational in Westfield really built upon its programs was by adding at least one "just for fun" family get-together night each month. In the winter months, we find these events to be hugely successful as people are feeling quite cooped up in their homes and it is a great way to get out and spend some time with one’s core family as well as with extended church family. One of these just-for-fun events is our family game night. Families bring their favorite board games and their favorite snack foods to the church and then have a great time playing games and eating. Many families try new games and find they enjoy getting to know one another better as much as they enjoy playing the games. Usually many of the parents have their own games of Boggle® or Scrabble® going on while the children play Operation® or Sorry®. Many families even take on one another’s families in their favorite games! Fun is ALWAYS had by all! 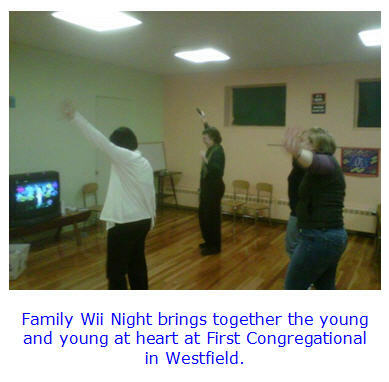 First Church also offers “Family Wii Night,” which is a similar event involving video games. Six or seven Nintendo Wii games are set up in the church school rooms and the families can jump from one game to another. Even some of the older members of the congregation come to see what all the fuss (and fun) is about. Some favorite Wii games include Rock Band (even our pastor joins in singing and dancing), bowling, and Mario Cart. Family Wii night has definitely become a church favorite. Family Movie Night is a bit more straight forward. A projector is set up in order to cast the film in a large area, and family-friendly movies are played*. Families bring their favorite candies and drinks while the church provides the popcorn. Families put blankets down and cuddle up for some fun. It’s a great way to bring warmth during a cold winter day. All of these events have wonderful participation – an average of about 45 participate -- and are entertaining ways to provide fellowship opportunities for our families and kids. Many new friendships have been forged through these events and fun has been had by all! You can contact Carrie at the church office at 413-568-2833 or churchschool@churchonthegreen.org. *Click here for information on how to comply with copyright law when showing a movie: http://macucc.org/pages/detail/2415.